I’ve neglected my cake pans for too long. Curled up circles of baking parchment haven’t sat waiting to be smoothed onto the bottom of a tin with a smear of butter in some time. I haven’t scraped the sides of my metal mixing bowl clean with one wipe of my spatula, or dropped cake batter in ribbons from a height. There have been no lemons or strawberries, no whipped egg whites waiting to be transformed into a continental frosting. The sieve hasn’t reduced cupfuls of flour into a sprinkling of gluten snow, instead draining rice or holding spinach leaves ready to be rinsed. 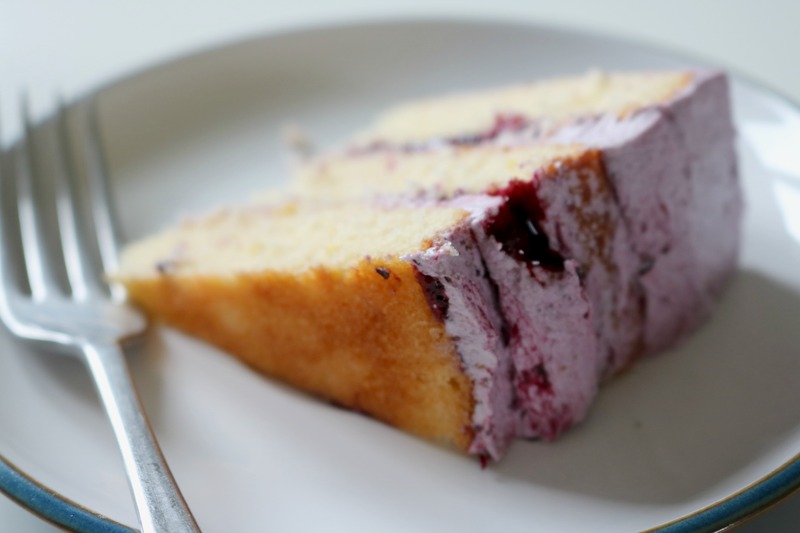 It’s been nine months since I last blogged about a cake. I think it’s time for a new recipe. I’ve never really had the patience to try creating a naked cake, for fear of the imperfections. The wonderful thing about Swiss or Italian meringue frosting is that it is very forgiving, one crumb coating and your cake is sealed, to be smoothed over again with another layer of thick creamy frosting flavoured with roasted fruit or salted caramel. But imperfections in cakes can be just as beautiful as their perfect siblings, a marble of a dark floral fruit coulis with lilac frosting. There can be no tantrums or upset over a naked cake, you are as beautifully imperfect as it is. You cakes may have domed in the oven or your coulis may not be silky smooth but a naked cake does not care. It coquettishly shows you what is beneath scant swipes of violet Swiss meringue, in this case three sharp layers of pillowy lemon sponge sandwiched with a lavender spiked blueberry sauce. I made this cake in miniature, because who doesn’t love beautiful tiny things? Beautiful tiny things can still be filling and flavourful, and just as delicious to eat as a cake that can feed twenty. While it can have soapy connotations of bath oils and hand cream, I love to bake with lavender and when cooked in a syrupy coulis the combination adds a hint of spring to the sharpness of fat juicy blueberries. 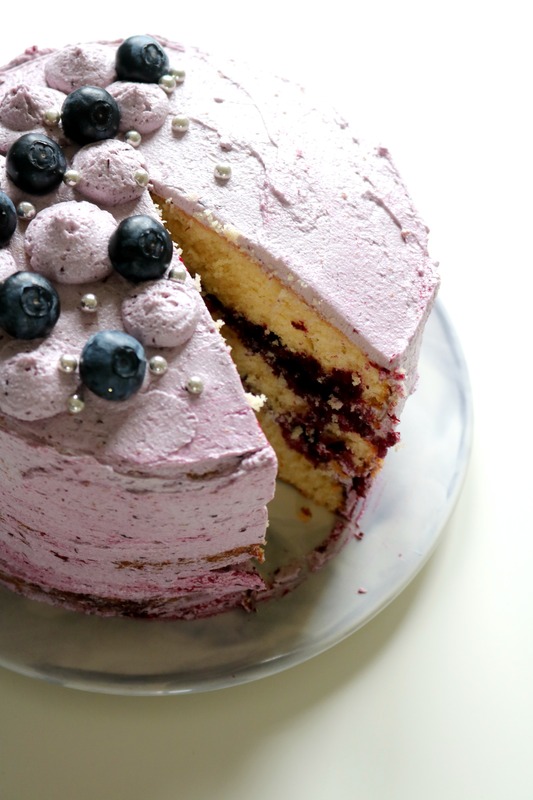 When your fork pierces a slice of this cake, it carries with it layers of soft whipped blueberry frosting, light lemon sponge and a sharp trickle of berry sauce. I’d call this the perfect bank holiday baking project, for while the recipe list seems long, I baked and photographed this pretty thing in around three hours. Perfect timing for opening a bottle of prosecco and toasting to an extra day off as spring gets fully under way. This makes more lavender blueberry coulis than you will need for the cake, but simply store the remainder in a jar and keep in the fridge for up to two weeks. A spoonful is delicious swirled through porridge made with coconut milk but i also imagine it would be a lovely addition to an ice cream sundae. Preheat the oven to 170oc/150oc fan and grease and line three 6 inch round cake tins with baking parchment. I only have two, so I baked my cakes in batches. In the bowl of a stand mixer or in a large bowl using an electric whisk, beat the butter and sugar together until thick, creamy and pale in colour. Add the eggs a little at a time, scraping down the sides of the bowl to ensure everything is well incorporated. The mix may split, but will come back together with the dry ingredients. Sift over the baking powder and self raising flour and gently fold into the mix then add the lemon juice, lemon zest and milk and stir until fully combined,. Divide between the three cake tins or reserve around 215g of cake mix for the third layer if you only have two tins. Bake in the oven for 20 minutes until golden and a skewer inserted into the middle comes out clean. Cool the cakes for 10 minutes then remove from the tins and leave to cool completely on a wire rack, removing the baking parchment. If required, wash and reline one of the tins and bake the third cake in the same way. To make the blueberry lavender coulis, place the blueberries, both sugars, lemon juice and water in a saucepan and place over a medium heat for around ten minutes, stirring occasionally. Once the berries have burst and the sauce looks juicy, use a stick blender or food processor to blend until smooth. Remove from the heat and leave to cool in the fridge. For the Swiss meringue buttercream, place the egg whites and sugar in a large heatproof bowl or the bowl of a stand mixer if using, then place over a saucepan filled with simmering water. Take care not to let the bowl touch the water or the eggs will scramble. Whisk the sugar and egg until frothing and bring the mix to 70oc on a thermometer to pasturise the egg whites. Remove the bowl from the heat and either place in a stand mixer fitted with a whisk attachment or use an electric whisk to continuing whipping the egg whites until stiff. Once the bowl is no longer hot and at room temperature, add the butter piece by piece until combined then spoon in the coulis, adding more to taste. Once the buttercream is stiff and lilac in colour, remove a few scoops and place in a disposable piping bag fitted with a large round nozzle. To assemble the cake, place one cake on the plate or cake stand you plan to serve it on. Take a third of the buttercream from the bowl and spread evenly across the cake. Using the buttercream in the piping bag, pipe a moat around the circumference of the cake and fill with around two tablespoons of blueberry lavender coulis. Place the second cake on top and repeat. Place the final cake on top and scrape the remaining meringue frosting on top, then smooth it across the top and around the sides of the cake. The aim is to make the cake look slightly undone and marbled, so if any coulis squeezes out from the middle, don’t panic, just incorporate it into the look of the cake. Try to patch any gaps between the layers using some of the frosting in the piping bag then once smooth, use the remaining frosting to pipe little dots on top of the cake by holding the piping bag vertically and quickly releasing pressure to create little points. 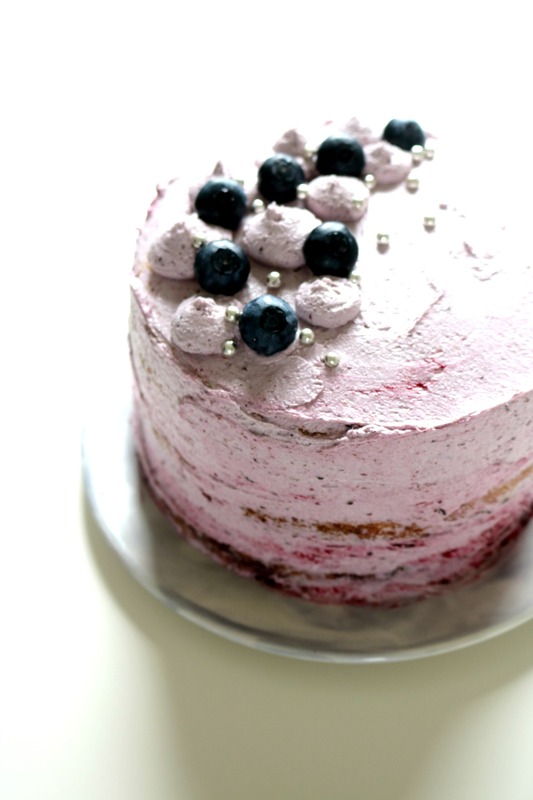 Decorate the cake with fresh blueberries and silver cake decorations or even fresh, edible flowers. Amazing looking cake..love the colour ! Oh my god this looks divine! Love that it’s a triple layer sponge rather than two. Thank you Iris! I can be very guilty of frosting cakes for up to 30 minutes trying to get it perfect, but when you limit the amount of frosting you have it makes it easier to take a step back and enjoy your work after just five! This looks amazing, I love that it’s miniature as well! Oh My God! This cake looks so amazing, I wanna try it! Though I’m a vegan, it would be nice to have a vegan version of this recipe! <3 Keep up the great work! Love your blog! Thanks Eliza, it is a lovely cake! If you’re vegan, may I suggest this cake instead? It is incredibly delicious and actually very apt for this time of year as we head into autumn! Thanks for stopping by! I thought this cake would be amazing and it definitely tastes so, but my sponge ended up being maybe an 2.5cm high at best and that’s only using 2 cake pans instead of 3. I followed everything correctly. 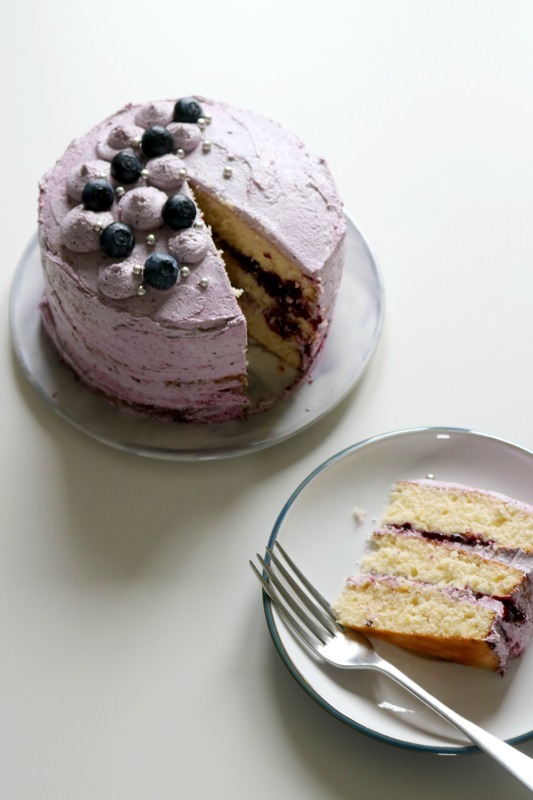 I’m not sure what happened but i’ll probably find another sponge recipe and just use the lovely lavender blueberry coulis and frosting recipe from this one. Hi Kellie, sorry to hear that about your cake. Could it possibly have been the size of the cake tin? I used small tins (5 inches) for this cake rather than a standard 20cm tin.